Well, the answer is, “yes and no”. No, because our hapless hero Kazuki Mutou still spends most of his time battling one homunculus after another. However, in Vol.2, his ultimate enemy, Papillon Mask, is finally unmasked, which makes the volume less light-hearted than before. 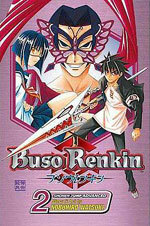 Here is Buso’s saving grace: the characters, especially Kazuki and his seasoned alchemist warrior partner Tokiko, are fun and easy to like. You can’t help but love Kazuki for his enthusiasm at his newfound powers and his clumsy attempts to hide his barely-disguised crush on Tokiko. There are also many laugh-out-loud moments as our hero tries to hone his raw abilities. Although he is enthusiastic, the alchemist-warrior-wannabe is a bit of an airhead, and this frustrates poor Tokiko quite a bit! Meanwhile, Tokiko, who is used to living a solitary life, has to deal with an alien situation: she is now the centre of attention at school! And due to their constant sudden disappearances, their fellow students think Tokiko and Kazuki are an item (and up to hanky-panky). The plot ratchets up a knot in Vol.3 when Kazuki has to make a life-changing decision and a new character emerges to guide Kazuki and Tokiko in a new mission. Apparently, an even more dangerous enemy has emerged: the League of Extraordinary Elects. However, just who is leading this new force may just surprise them! Because their enemies seem so non-threatening, you never really believe that Kazuki and Tokiko are in any danger. And because you feel like giggling each time a bad guy appears on the page, the dramatic tension is ruined. 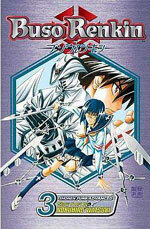 Unless, well, we’re supposed to regard Buso Renkin as a comedy. One is never really sure. Thankfully, at the end of Vol.3, we are introduced to two new opponents who seem to hold much promise. They are not one-dimensional; heck, you wish they weren’t bad guys at all. Now, that bodes well for Vol.4.